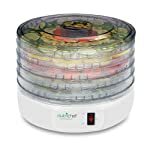 Best Food Dehydrator Reviews - Comparison Charts and Guides! Below you will find honest food dehydrator reviews in 2019, side by side comparison charts, a complete buying guide and a lot more information like details about the top brands in the business, how-to guides, tips and FAQs, everything that is needed in helping you to decide on the best dehydrator for your home! If making jerky is your thing, you can skip right ahead to the best food dehydrator for jerky page! Food drying using a top food dehydrator is a popular, safe and simple way to preserve it for later use. Dehydrated food is a versatile source of nourishment; it can be eaten as is, used as an ingredient in cooking or re-constituted by soaking it in water. It has none of the costs and labor associated with canning, and is more space efficient than freezing. Dehydration at low temperatures retains the nutrients and enzymes, while reducing its bulk, allowing easy storage. These days there is a wide range of food dehydrators available, with everything from entry level to professional models at affordable prices, made from stainless steel or plastic. Whether it is a no frills, single temperature, stackable dehydrator, or a digitally controllable cabinet dehydrator with variable temperature and timer settings, you will always be able to find the best dehydrator that suits your needs. We have provided an overview of a number of food dehydrator reviews, along with tips and information to help you choose the one that is just right for you! If you are looking to try food dehydrating to see if it suits your lifestyle, but are not sure how seriously you want to get into it, then it’s a good bet to start with a small, economical model like the Presto 06300 Dehydro Electric. 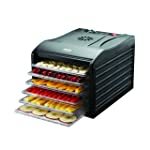 Presto 06300 is a four-tray, fixed temperature, vertical airflow, 600W food dehydrator has a capacity of approximately 4 sq. ft. that can be doubled with the purchase of an additional 4 trays over time. Presto 06300 is the best food dehydrator for making jerky, but if meat-eating is not your style then fruits, vegetables, herbs and spices can be dried with this unit. The accompanying manual contains detailed instructions for preparing and processing a wide range of foodstuffs using this preset temperature appliance. The clear cover allows the contents of the top tray to be monitored during the dehydration process, and the trays are easy to wash and dish-washer safe. In addition, the trays can be inverted on the base to reduce the overall height of the appliance, for easier storage when it is not needed. The power cord can also be wrapped inside the base of the unit, adding to convenient storage. The lack of a timer, variable temperature settings and on – off switch are made up for by the quality of the appliance, and can be partly overcome by the use of a separate kitchen timer, or a plug-in wall timer unit. The absence of even a single fruit roll-up sheet insert with the basic unit is unfortunate, but it can be purchased separately. In addition, caution must be exercised in setting out food portions on the trays, as the gaps between spokes in the trays increase towards the outer rim, and small portions that shrink as they dry can fall between the spokes. National Presto Industries, Inc., the producer of the Presto 06300 Dehydro Electric Food Dehydrator, has made a concerted effort to improve its customer responsiveness, so if you have any problems or queries, help will be just a call away. Renowned US producer, Excalibur, has taken its popular 3900 food dehydrator to a new level with the 3926TB model, which boasts a 26-hour timer and automatic shut-off. The unit is available in two colors, either black (featured in the picture) or white. Now you can just set the temperature and timer to the settings required for the food you are dehydrating, and let it do the rest. No more worrying about the dehydrator over-drying if you forget to switch it off. You are also not tied down while Excalibur 3926TB is being used, and you can let it run during the night until it switches itself off. The 3926TB/W is available in black or white, and the nine BPA-free 15” x 15” trays give the unit a total 15 sq. ft. of drying space, with the possibility of reducing the number of trays to increase height available for drying thicker slices of food. By removing all the trays, it is possible to fit half-gallon jars into the unit, for example, for making yoghurt. The powerful 7” fan, 600W heater, and trademark ParallexxTM Horizontal Air-Flow Drying system provide increased efficiency in drying foods and, combined with the built-in timer, make food dehydration so much quicker and easier. In a comparison test with another leading brand, the 3900 series showed a saving in electricity of 15% during a dehydration cycle. The detachable door makes for better cleaning as well as easier access to the drying trays and their contents. The tough, lightweight polycarbonate construction makes this dehydrator easier to move around, so as to free up kitchen counter space when it is not in use. The addition of the built-in timer and automatic shut off has been widely praised, with almost all customer reviews saying that the extra cost is well worth the benefits they bring to this high capacity food dehydrator. Large capacity at 15 sq. ft.
At last, an affordable food dehydrator with stainless steel drying trays as well as a built-in timer! Magic Mill Pro 6-Tray Countertop should please a large section of customers who have been searching for these features at a price that won’t dehydrate their wallet :). Magic Mill Pro has digital controls located in a convenient and easy to use position at the front of the cabinet. The timer has half-hour steps up to 19.5 hours, and there is also a digital thermostat with 8 preset temperatures from 95°F through 158°F. The countdown timer has an automatic shutoff function when the time has elapsed, and the unit has overheating safety protection, so it is easy and safe to use. The fan and heater unit are located at the back of the cabinet and, with a large 7” diameter fan, provide even heating for all six trays at once – no need to rotate them. The location of the fan and heater unit removes the risk of food particles falling into it and causing problems. This, along with the presence of a drip tray supplied with the appliance, make it easier to keep the interior of the cabinet clean. The clear door allows you to monitor the dehydration process without having to open the dehydrator and disturb the air flow. The fan is relatively quiet compared with several other makes and the unit is attractively finished, making it an asset to anyone’s kitchen. It is neither small nor as light as machines with plastic trays, so this appliance will take pride of place on your kitchen counter! The Magic Mill Pro Countertop Dehydrator is supplied with 6 BPA-free plastic fine mesh inserts, 3 fruit roll-up inserts, a pair of silicon oven gloves and a drip tray; that’s good value at a very good price. NutriChef Kitchen PKFD12 5-Tray Electric Countertop is an attractive and useful addition to any kitchen, and its budget price means that you won’t have to break the bank to get into food dehydration. This entry level food dehydrator, with its preset temperature and low power 250 watt heater element doesn’t have all bells and whistles of more expensive ones, but for many customers, it provides the means of eating healthier food at a more affordable price. The stackable trays are easy to assemble and versatile; their number can be varied and the distance between them can be increased slightly for thicker foods. They are made of BPA free clear plastic, so they are safe to use and very helpful in monitoring the food dehydration process on all levels. This is very necessary as the vertical airflow necessitates vertical rotation of the trays in order to ensure even dehydration on all of them. The base of this stylish unit contains the fan and heater unit as well as an on – off switch. The placing of the unit has its drawbacks in that a vertical airflow is not the most efficient means of dehydrating food on this scale, and its position also makes it vulnerable to food particles causing problems. The inclusion of a built-in power switch will, however, certainly increase its popularity. The NutriChef Kitchen PKFD12 5-Tray Electric Countertop is not for people who want to make ‘raw’ dehydrated food – the preset temperature is too high – and those who don’t have time to manage the dehydration process, but it will be ideal for the small scale ‘jerky junky’. So long as the appliance manual’s recommendations for food preparation and dehydration processes are followed, PKFD12 will continue to produce tasty and nutritious dried food treats. Excalibur, one of the leading producers of dehydrators in the USA, has recently released a digitally controlled version of its popular 9-tray dehydrator. Excalibur ﻿﻿39﻿﻿﻿﻿48CDB﻿﻿ 9-Tray Digital has a two-step temperature and timer controller that allows automated flexibility in drying temperatures and time periods, making for easier and more efficient food dehydration. The timer also has an automatic cut-off at the end of the time period, but an inbuilt memory that avoids the need to reset the timer if the door is removed and replaced, or if there is a power cut. With its digital timer and rear-mounted fan, the Excalibur 3948CDB Dehydrator boasts Excalibur’s trademark ParallaxTM Horizontal Air-Flow Drying system and its HyperwaveTM Fluctuation technology, providing even drying of foodstuffs throughout the unit in a shorter timeframe than other similar models, avoiding the necessity to shuffle trays and food segments during the drying process. The unit can be set to run at a higher temperature initially in order to evaporate surface moisture and prevent growth of mold or bacteria on the food, and then to drop to a lower temperature to draw moisture from interior of the food to the surface and evaporate it in an even manner. The nine BPA-free 15” x 15” trays give the unit a total 15 sq. ft. of drying space, with the possibility of reducing their number to increase height available for drying bulkier foods. By removing all of them, it is possible to fit half-gallon jars into the unit, for example, for making yoghurt. Keeping track of your dehydrator’s progress has never been easier, with the unit’s removable, lightweight, see-through polycarbonate door and digital timer memory. The thermostat’s temperature range of 95°F to 165°F means that fresh foods such as fruit, vegetables and herbs can be dried at a temperature low enough to avoid destroying their nutrients, while the unit can reach the temperature of 160°F required for safe drying of meat to produce jerky. The Excalibur 3948CDB Food Dehydrator is simple to use and easy to clean, it is quiet, durable and lightweight, and all its materials are FDA-compliant. 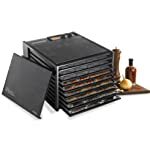 At less than half the price of similar rectangular fan-at-rear dehydrators, Aroma Housewares Professional AFD-815B 6-Tray is very affordable for buyers who will want to do a lot of food dehydration, rather than just the occasional user. Aroma AFD-815R model has received very good reviews regarding its capacity, performance and reliability. It’s worth the extra cost for this stylish, versatile and easy to use food dehydrator, with its rear-mounted fan and heater unit producing even dehydration across all six trays. Its additional tray guides provide flexibility in tray spacing, allowing a useful level of versatility in terms of dehydrating different thicknesses of food slices at the same time, and the clear door makes it easy to monitor the food dehydration process. In spite of its relatively large 5.4 sq. ft. drying capacity for a 400W unit, the Aroma Housewares Professional is fairly light and compact, making it easy to move or store when not in use. The drying trays are not dishwasher safe, and must be hand-washed. However, the drip tray and removable door make it easy to keep the rest of the unit clean. The dehydrator is supplied with one mesh insert for drying smaller food items such as herbs and seeds, but no fruit roll-up sheet is provided. The Aroma AFD-815B 6-Tray doesn’t have a built-in timer, but, for an additional one third of the price, the similar NFD-815BD in white has both digital thermostat and timer built-in. It is, of course, possible to use a kitchen timer or a plug-in wall timer in place of a built-in timer. The AFD-815B is a mid-level model, which will suit buyers who are looking for more than just a basic food dehydrator, but who don’t see the need for the features of a more advanced model. Only 1 Mesh insert and no fruit roll-up sheets supplied (Aroma does not make fruit roll-up sheets). Gaps in tray grids are relatively large. Instruction booklet contains only 2 recipes. Are you looking for an affordable, easy to use food dehydrator with variable temperature settings, from a reputable manufacturer? Then the Waring Pro DHR30 Professional Dehydrator is well worth considering. It has three temperature settings, a ‘fan only’ option, and a built-in on-off switch, offering a level of versatility and convenience that will make life that much easier for you. With its stylish looks and compact size, the Waring Pro DHR30 Professional Dehydrator will be a classy addition to your kitchen, without dominating counter space. The single control button and five stackable, interlocking drying trays make it one of the easiest models to operate available in this market segment. With three temperature settings, you can dehydrate a wide range of foods using this dehydrator. You’ll be able to make jerky from beef, chicken or turkey, to dry fruit such as apples, bananas, peaches, even strawberries and a whole lot more, as well as herbs and vegetables. The Waring Pro DHR30 Professional Dehydrator is also ideal for making kale chips for snacks, or dried tomatoes for adding to other dishes or salads, all at a fraction of the cost of buying them from the store. When set on the ‘High’ thermostat setting, the dehydrator will exceed the minimum temperature required for making jerky, while the lower settings can be used for other types of food in order to avoid destroying the nutrients and enzymes that are contained in them. According to the manufacturer, all food contact surfaces are made of BPA-free plastic, and the trays are dish-washer safe for ease of cleaning. The unit is shipped with a fruit roll-up sheet, to be used on the top tray for making ‘fruit leather’ from fruit puree, or for making similar dried products from liquids or semi-liquids. Also included is an instruction manual that includes food preparation guidelines and some useful recipes. The 500W stackable NESCO American Harvest FD-61WHC 5-Tray Snackmaster® Express, with its ‘All in one’ kit, offers you great value for money. At a very affordable price, it beats the competition with all the extras that are packaged with it, including a jerky gun and spice and cure packs. When you open the box, everything you need to start making a wide range of dried food, including jerky, is right there waiting for you. FD-61WHC Snackmaster is expandable so you can buy up to seven extra trays to add to the original five, boosting your drying surface from 4 sq. ft. up to 10 sq. ft. 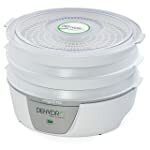 Although this might be slightly less than some other dehydrators in the same price bracket, the smaller drying surface is matched to the relatively lower power rating of the heater element. Finding the temperature to suit what you are dehydrating is easy with the Snackmaster® Express, it has a thermostat on the lid with settings marked for each different type of food, from herbs and spices at the lowest setting (90°F), to jerky at the highest (160°F). Fruit Roll Sheet inserts are provided so you can make ‘fruit leather’, and flexible Clean-A-Screens® are also included so you can dehydrate finer food items like herbs without any bits falling through the trays. All the parts are easy to remove for cleaning and simple to put back together again. The Snackmaster® Express, like most similar dehydrators of this size and price, doesn’t have an on-off switch or a timer. This apparent obstacle can easily be solved by buying a plug-in wall timer with its own on-off switch, or plug it into a switchable power strip and control it from there. Other than that, the overwhelming majority of customer reviews for this compact, handy appliance are positive, and it is a highly recommended appliance. No on-off switch, the unit must be unplugged after use. Need to lift stackable trays to monitor food, interrupting the airflow. A 600W stackable Dehydrator with a 5 sq. ft. starting capacity, expandable to 12 sq. ft., and a price-tag that doesn’t reach triple figures, offers you a great way of getting started with food dehydration. 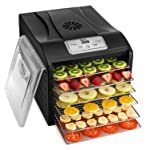 The NESCO FD-75PR 5-Tray Snackmaster® Pro is one of the best for the money, and you will make back what you pay in healthy, nutritious dried fruit, herbs, spices, and even vegetables in no time. You’ll also be able to eat delicious jerky as the dehydrator comes packaged with flavor and curing packs specially prepared for making jerky. Setting the temperature of dehydrating is pretty easy to do with the Snackmaster® Pro. It comes with an included thermostat on the lid, with clear settings marked for each type of food. As such, the lowest setting (90°F) for herbs and spices to (160°F) for jerky which is also the highest. You can make the so called "fruit leather" with the Fruit Roll Sheet provided. If you want to dehydrate finder foods like herbs, no bits will be falling through the trays because of the included flexible Clean-A-Screens®. Cleaning the unit is easy as all the parts are easy to remove and simple to put back together again. The unit is delivered in its advertised 5-Tray format, but up to an extra 7, purchased separately, can be added to the configuration to increase its capacity to 12 sq. ft. of drying surface. The spokes in some trays can be removed to fit small jars or larger food portions in the dehydrator. One of the drawbacks of the Snackmaster® Pro is that it doesn’t have an on-off switch, nor a timer. This can be solved by buying a plug-in wall timer with its own on-off switch, or plug it into a switchable power strip and control it from there. Otherwise, almost all the customer reviews for this compact, handy appliance are overwhelmingly positive, and it is highly recommended. For a top-end food dehydration experience with the assured safety of all food-grade stainless steel cabinet and trays, rear-mounted fan and heater unit and large drying capacity, the TSM Products D-5 Stainless Steel really delivers! Containing 5 stainless steel trays with a combined capacity of 8 sq. ft., built-in power switch and timer, and variable thermostat, the US-made TSM Products D-5 is difficult to beat. Its bold clean lines and stylish looks will tend to dominate a kitchen, where it will be a feature rather than an accessory. The unit is easy to maintain, its door and rear unit are detachable and its smooth stainless steel surfaces are simple to clean. The stainless steel shelves can be washed by hand or in a dishwasher without fear of them warping or breaking. The large fan and powerful 800 watt heater, located on the rear panel, ensure that food on all the drying trays is evenly dehydrated, without the need to vertically rotate the trays. The variable timer, which lasts up to 27 hours, will ensure that even if the dehydrator will do its work without having to be constantly monitored. Should you prefer to experiment with drying times, there is a ‘constant on’ setting which over-rides the timer, allowing you to manually switch the unit off. The variable thermostat has five ranges, one for each food type, which are indicated by a set of color coded bars on the control panel. The thermostat can be set anywhere within these ranges, as you get used to its performance. There is a small hole in the center of the door through which the probe of a food thermometer can be inserted to check the interior air temperature. Unfortunately the food thermometer is not shipped with the appliance and will have to be purchased separately. The spaces in the racks are ¼” squares which are small enough for most foodstuffs, but if a finer mesh is required, it can be purchased separately. The same applies with regard to fruit roll-up sheets for making fruit leathers. Overall, however, TSM Products Stainless Steel represents value for money and, although it is more expensive than other 5-tray cabinet dehydrators, its all stainless steel construction will attract serious food dehydration enthusiasts. Domestic electric food dehydrators are a relatively new phenomenon that is growing in popularity, and more players are jumping on the bandwagon of supplying them. With all the different types, styles and brands available, many with brand names that represent suppliers rather than manufacturers, it is good practice to read reviews and to look at what is behind the name before picking the best food dehydrator on the market for your home. Whereas traditional food dehydration could only take place on warm dry summer days, nowadays there are electric food dehydrators that you can use in your home any time of year. So if you have a bumper crop in your vegetable garden, or buy a bulk load of fruit at a bargain at the local supermarket, there’s no need to waste any of it by letting it go rotten. The decision on which is the top dehydrator for you to buy will be based on a number of factors, including size, power, versatility, ease of operation, portability and price. However, there are two main types of dehydrators: vertical airflow dehydrators and horizontal airflow dehydrators, each with its own advantages and drawbacks. We’ll look at these before going on to examining the other factors. A problem that may be encountered with a machine that has its fan and heater unit in the base of the appliance is the potential for small food particles or juices to fall into the unit, possibly causing problems with the electrical circuit or the moving parts of the fan. So if a vertical airflow food dehydrator is all that your budget will allow you, look for one that has a top-mounted fan and heater unit. Failing this, find one that has a base where the slots for the fan-heater unit are protected from food particle ingress, either with a mesh or by being raised sufficiently above the rest of the base. Vertical airflow dehydrators generally have circular stackable trays for drying the food. There are usually four or five trays in entry level dehydrators, and this number can be increased up to about 12 by purchasing extra ones separately. Each one has a drying area of about 1 sq. ft., so the total drying area can vary from 4 to 12 sq. ft. Be sure, however, to find a dehydrator with a 600 watt heater if you want to go for the extended number of trays, otherwise you will be in for a long, busy and potentially frustrating experience. Some vertical airflow stackable dehydrators do have built in variable or adjustable thermostats. These models can be set to a different heating temperature, depending on what type of food is being dehydrated. Most vertical airflow models are made of BPA-free plastics, at least where food contact will takes place, such as tray racks. Most horizontal airflow food dehydrators take the form of a cabinet containing drying racks, with the fan and heater unit in the rear of the cabinet. Some manufacturers of stackable dehydrators, however, claim to use horizontal airflow via a design that forces the heated air in from the hollow sidewalls of the trays and vents it out through the central column. An example is the Converga-Flow® drying system found in some of the Nesco American Harvest stackable tray models. Horizontal airflow models generally have a built-in variable temperature control and on-off switch. Some models will also have a built-in timer and auto shutoff mechanism, making them more versatile and convenient to use. Each tray can range in size from about 1 sq. ft. to over 1.5 sq. ft., depending on the size of the unit, so a larger 9-tray unit can accommodate a drying area of over 14 sq. ft.
One of the best known horizontal airflow food dehydrator manufacturers in the United States is Excalibur, but there are many other makes on the market, such as Aroma, Magic Mill and TSM. Units in this range tend to be more expensive than the vertical flow ones, and are generally made of a polycarbonate body with BPA-free plastic or food-grade stainless steel racks. In the case of more expensive models, one can find dehydrators that are made entirely of food-grade stainless steel. Food dehydrators come in a variety of sizes, from small cylindrical ones to large box-shaped units. The size of unit that you are looking for will depend to a large extent on the amount of use you intend to get out of it. Also, if you have a small kitchen and need to use your counter space as efficiently as possible, the options are to buy a small dehydrator, or find another space for it, such as in the laundry or garage. Typically, low volume users buy a stackable vertical airflow dehydrator that can be pulled apart for easy storage when not in use. Alternatively, some small box-style horizontal airflow dehydrators may be able to fit inside a kitchen cabinet for storage. For those who expect to do a large amount of food dehydration during the year, the options are also to find a space other than the kitchen where the appliance can be used, or to consider buying a large dehydrator that will be a feature in the kitchen. The drying capacity generally depends on the power rating of its heater unit and the operation of the fan. The higher the heater power rating, the more heat is introduced into the dryer and the faster the food will dehydrate. The fan also helps to circulate the warm air to increase the amount of moisture that is removed, speeding up the drying time. Care should be taken, however, not to over-dry the food either by allowing the air to overheat in the dehydrator as a whole, or in any particular part of it. So for a small dehydrator, a high power rating may lead to over-drying of food if it is not monitored closely, whereas a low power rating for a large dehydrator will cause the food to take excessively long periods to dry out. Vertical airflow stackable dehydrators usually have power ratings of 250 watts, 400 watts or 600 watts, whereas horizontal airflow cabinet dehydrators are usually rated at 400 watts, 600 watts or 800 watts. 600 watts would therefore be a relatively high rating for a small dehydrator of 4 or 5 sq. ft. drying area and an average rating for a large one of 10 to 15 sq. ft. It is best to look for a model with a high power element and a variable temperature control, as this will give you the best range of options for even dehydration of a wide range of food types. If you want to only produce ‘raw’ or natural dried foods, then a dehydrator with a low preset temperature (115°F) will be suitable. And if you only want to make jerky, then you will need a dehydrator with a high preset temperature (165°F). Food dehydrators can be used for dehydrating a variety of food stuffs from fruits to herbs to jerky, as well as for making yoghurt, and even for crafts such as making potpourri or drying flowers. The versatility depends largely on its features, some of which are variable temperature control and removable trays. The ability to set the temperature of the dehydrator to best suit the type of goods you will be processing is essential for ensuring that you don’t end up with over- or under-dehydrated products. The ability to remove trays from a dehydrator in order to fit larger items, such as jars of yoghurt, is a big plus. This is only really possible with cabinet type dehydrators. With stackable tray dehydrators, some models allow you to increase the space between two trays by inverting the top tray by turning it upside down, but this will only really increase the amount of space by fractions of an inch. An entry level food dehydrator typically has no temperature control or timer, so it will operate at a fixed temperature until switched off (this will often require unplugging the appliance since many do not have a built-in power switch). The simplest form of electric food dehydrator contains a heater and a fan, directing hot air up through a stack of perforated trays holding slices of food. Models in this range retail for about US$30 to US$40 and are usually supplied with four or five trays. The appliance plugs straight into the wall socket and has no controls or power switch. The heating element will usually be either 250 watts or 400 watts or 600 watts, and the operating temperature will be preset at either a low temperature such as 115°F, or a higher temperature such as 165°F or even 180°F, with no option to vary the temperature. Horizontal airflow dehydrators typically have their controls located on the top of the cabinet, at the rear. Some models, especially those with digital controls, usefully have them located at the front of the panel, which makes it much easier to see and reach them. This is especially useful if the unit is placed on a shelf. Bear in mind, when buying such an appliance, that raw diet type dried foods should not be dried at a temperature higher than 118°F, while jerky requires a drying temperature of at least 150°F in order to be safe for consumption. If your budget dictates that you purchase a fixed temperature food dehydrator, then be aware that you can probably either not make jerky with it if it uses a low preset temperature, or not be able to keep to raw food if it has a higher temperature. There is, however, the alternative to pre-cook your meat before dehydrating it to make jerky, if the preset temperature is below 150°F. A potential drawback of the fixed temperature type models is that it requires you to check on it every few hours to ensure that all the food is being dehydrated evenly, and none is being over-dried. This requires the top trays, which receive the least heat, to be exchanged periodically with the lower trays, which receive the most heat. It may take some getting used to, but if you have time, it will still make very tasty dried food. Several models have doors or sides made of clear plastic (polycarbonate) that allow the food inside the dehydrator to be monitored during the drying process. Other manufacturers claim that, by excluding light from the food during the dehydration process, the nutrients in the food are protected from damage by light. This claim is not backed by evidence and there is nothing wrong with buying a food dehydrator with see through components. Especially with basic dehydrators that have neither temperature control nor a timer, it is preferable to be able to see into the dehydrator to monitor the state of the food, without having to open the appliance and disturb the airflow. Generally speaking, the cylindrical shape and ‘stackability’ of vertical airflow food dehydrators make them easier to move and store, allowing them to be taken along on holiday or hunting trips. Some smaller cabinet-type dehydrators which are relatively light and compact, like the Aroma which only weighs 11lbs, can also be considered portable units, but the larger cabinet types such as the Excalibur and TSM are definitely best left in one spot! How much is the best dehydrator for the money? Basic entry level stackable food dehydrators can be purchased for less than US$30, going up to about US$60, with more versatile models going up to about US$100. Cabinet type dehydrators generally start at about US$60 and go up to about U$200, with more advanced models costing from US$250 to over US$400. Some of these offer the option of food-grade stainless steel trays. Top of the range dehydrators, some like TSM made entirely of stainless steel, are in the US$400 to US$500 bracket and will please people who would like to avoid any form of plastic in their food dehydrator. When looking to choose the best dehydrator, be aware that some appliances are sold with necessary extra inserts, and some are not. Food drying trays usually have relatively large holes in them to allow for better air flow, but sometimes these holes are larger than the dried food pieces you are producing, since the food shrinks in size as it dehydrates. Fine mesh inserts are essential for drying small food particles such as seeds and herbs. Fruit roll-up inserts are needed if you want to make fruit leather from puree or fruit juice. If you are on a limited budget, check if any of these are supplied with the food dehydrator, and, if not, how much the total package will cost if you purchase them along with the dehydrator. Usually, you will get a better quality appliance without extras for the same price as a lesser quality dehydrator supplied with extra tray inserts. But this is not always the case, so look for the best quality food dehydrator you can afford on a special that includes tray inserts. For those who like to make jerky, some dehydrators are available with a jerky gun included. The jerky gun allows you to mix ground meat and spices together and then extrude them into strips for easy dehydration. If you prefer to marinate strips of meat and lay them in the dryer, then you can do fine without the jerky gun. The top three food dehydrator brands, in the entry and serious dehydration ranges, are NESCO, Presto and Excalibur. In this section we review and have a look at the history of each and some of the dehydrators and other appliances for which each brand is well known. NESCO, which derives its name from the National Enameling and Stamping Company, had its origins in Wisconsin in the1930’s and has been a trusted household name for many years. In 1981, NESCO, which had been producing roaster ovens, was purchased by The Metal Ware Corporation, a company which had also originated in Wisconsin, in the 1920’s, and has a history of manufacturing electrical cooking appliances. Metal Ware expanded the range of roasters available and added accessories such as the Roast-Air Convection Oven® and the Nescote® non-stick interior. The NESCO label was retained and became a nationally recognized brand in 1991 when the QVC television shopping channel started marketing NESCO roasters. This also led to their wider distribution in retail stores and to the launch of a new product, the Roast-Aire convection roaster. In 1997, Metal Ware Corporation acquired the assets of American Harvest – which had patented food dehydrators since the 1980’s as Alternative Pioneering Corporation, Inc., and created a new brand, NESCO®/American Harvest. The Metal Ware Corporation produces the Open Country® collection which includes a range of pressure cookers, food grinders and slicers, juicers, hand blenders and the Jet-Stream Oven. Nesco American Harvest food dehydrators are available in a range of sizes and shapes (round, square and rectangular), but all use the stackable trays format, and all except two (the Gardenmaster FD-1010 Pro and the FD 2000 Digital Square) use the top-mounted fan-heater unit and Converga-Flow® system patented by the Alternative Pioneering Corporation. Although the FD-28JX is termed the Jerky Xpress, it is not one of the models endorsed by the University of Wisconsin, although the FD-1040 Gardenmaster Pro does have its endorsement. For those who are looking at the popular FD-75PR Pro, the newly released FD-77DT is now available with similar features and a digital timer and temperature control in place of the FD-75PR’s analog temperature control and no timer. Unfortunately the FD-77DT is supplied with one less tray and fewer tray inserts, but does not cost a lot more. Excalibur Dehydrators started out in 1973 as a family owned business manufacturing food dehydrators in Sacramento, California. Food dehydrators and their accessories, both domestic and commercial, are the sole focus of the company and its reputation for innovation, quality and service has grown over the years. The company was acquired by The Legacy Companies group in 2011. The Legacy Cos., which was only founded in 1998, consisted of two operating entities, Ashbury Food Service and Greenfield World Trade. With its headquarters presently in Fort Lauderdale, Florida, The Legacy Cos. subsequently acquired a number of brands, including Kold-Draft®, Maxximum®, Zeroll®, Omega®, General®, Blakeslee® and Excalibur®. Blakeslee invented the commercial dishwasher machine in 1880. Kold-Draft was founded in the 1920’s to manufacture domestic water pumps and is now a leading producer of horizontal ice-making systems. The design for the modern ice cream dipper was developed by Zeroll and it is now a leading brand in kitchen accessories and portion control scoops. The Excalibur range of food dehydrators includes 2 commercial stainless steel models; the 1 Zone and 2 Zone NSF Commercial Dehydrators, as well as 4-tray, 5-tray, 9-tray and 10-tray domestic horizontal airflow cabinet-style models. These domestic dehydrators are available in a number of formats, with or without timers (for example the 3900 has an analog temperature control but no timer, the Excalibur 3926 has an analog temperature control and a 26 hour analog timer, and the Excalibur 3948CDB has a digital timer and digital temperature control). The domestic models are all made of FDA-approved polycarbonate with BPA-free plastic trays, but it is possible to purchase food-grade stainless steel trays as an alternative. Excalibur also markets 2 entry level stackable vertical airflow dehydrators, the circular EPD60W with top mounted fan-heater unit and the rectangular ECB50B with base-mounted fan-heater unit. The 3900 is one of the most popular Excalibur food dehydrator models, however, the 3948CDB is the ‘flagship’ of the Excalibur range. Presto originated from the Northwestern Steel and Iron Works, established in Wisconsin in 1905 as a manufacturer of pressurized steel canners. During the 1920’s the company became one of the largest cast aluminum cooking utensil manufacturers in the world, and changed its name to the “National Pressure Cooker Company”. The company introduced its first saucepan-style pressure cooker in 1939, with the trade name of “Presto”. This became such a widely recognized household name that in 1953 the company changed its name to the ‘National Presto Industries, Inc.’, now more commonly known simply as Presto®. The company introduced its first electric appliance in 1949, the Presto vapor steam iron, which was an immediate success and led National Presto to develop new products bearing the Presto label. During the latter half of the 1950’s, National Presto Industries patented the Control Master®, a removable heating control system that allowed electrical appliances to be safely washed in water, and produced the world’s first submersible automatic stainless steel coffee maker. With its growing success, the company was listed on the New York Stock Exchange in 1969, and in 1974 introduced the PrestoBurger® electric hamburger cooker. This was followed in 1976 by the FryBaby®, a compact electric two-serving deep fryer, the family size FryDaddy deep fryer in 1977, and the larger GranPappy® deep fryer in 1978. With the early growth of health consciousness in America, Presto’s PopCornNow® air-heated popcorn popper, also released in 1978, was soon a big hit. This was followed up by the introduction of the SaladShooter® electric shredder/slicer in 1988 and in 1994 by the PowerPop® microwave popper. In 2000, Presto brought out the compact Pizzazz® home pizza oven, adjustable to the size of pizza, and which cooked the pizza faster than in a conventional oven. Presto has a range of three stackable vertical airflow food dehydrators which range from the basic Presto 06300 model with four trays (expandable to eight trays) and controls limited to an on-off switch; to the 06302 model which is supplied with six trays (expandable up to 12 trays) and has an on-off switch and an analog temperature control; up to the 06301 model which is also supplied with six trays (expandable up to 12 trays) but has a digital timer with auto shut-off and a digital temperature control. Drying food is one of the oldest known means of preserving food, and dates back at least to the time of the ancient Egyptians, with dried foods having been found in the pyramids and other tombs. This food was so well preserved that some of it was still (potentially) usable when it was found in the twentieth century. Soon, other companies that had been manufacturing domestic cookware began producing domestic appliances that used electric motors, heaters and fans. Examples include The Metal Ware Corporation, National Enameling and Stamping Company, Northwestern Steel and Iron Works, and Waring Corporation – which introduced the first electric food mixer to the world in 1937. In 1973, family firm Excalibur began manufacturing domestic scale food dehydrators in Sacramento, based on the commercial model, and the Alternative Pioneering Corporation, Inc., which later became American Harvest, Inc., patented stackable food dehydrators in the 1980’s. Since then, domestic electric food dehydrators have become more and more popular and many more companies have started producing them, but some of the leading brands remain those who pioneered the concept. Food dehydrators come in many sizes and formats, as has been shown above, but they all have one purpose: to make it possible for you to make healthy dried food in the convenience of your own home. These are electric food dehydrators that use a heating element and fan to replicate the best conditions of natural food dehydration, but even this does not remove the need for careful and safe preparation. Once the food is dehydrated, it can be stored in airtight containers such glass jars or zip-lock bags, and can be kept for varying lengths of time, depending on the type of food and the degree of dehydration that has taken place. The sections below are a broad outline of the food dehydration process and is intended only for general information, each make of food dehydrator will have its own characteristics and the respective user manual must be consulted. Always follow the safety instructions for your particular model, as contained in its user manual. Before using it for the first time, thoroughly wash all the trays and whatever other non-electric components that can be safely washed in warm soapy water, to remove any traces of contamination that may have been left during the manufacturing and delivery processes. Rinse and dry them well, and wipe the rest of the unit with a clean, soft, slightly damp cloth. Run the unit for a few hours without food in it before its first use, to vent out any residues from the manufacturing process. Wash the components again after every use to ensure that the dehydrator is clean when raw food is placed in it. Separate all the trays and install mesh inserts or fruit roll-up inserts if these are required or available. Lay the trays out in such a way that it will be convenient, easy and hygienic to place the food on them. Set the base on a level, dry surface and, if it does not have its own on-off power switch, do not plug it into the power socket until ready to use. Note that the interior of a food dehydrator can reach up to 185°F, so take care to avoid burns when opening the unit. Correct preparation of the food is the next important step, and you should again always consult the dehydrators user manual before starting. Firstly wash any utensils and your hands before preparing the food. Wash the fruit or vegetables in clean water and dry with a clean towel or cloth. Do not use over-ripe fruit or vegetables for dehydration, although slightly over-ripe fruit or vegetables can be used if the over-ripe portions are cut out. Then cut the food into even slices, as recommended for the type of food you will be drying. For example, apples, peaches, pears, pineapples and strawberries should generally be cut into ¼” thick slices, bananas 1/8”, nectarines 3/8”, cherries cut in half and small berries dried whole. Although dehydration prevents microbial growth, some chemical reactions may take place owing to the enzymes in the foods and they may change color during the drying process. To prevent this, pretreat them as recommended in the manual, for example, apple slices can be dipped in citrus juice to prevent browning during dehydration, or blanch fruits with hard skins. Lay the food out on the trays, making sure that no slices touch each other or overlap one another. Avoid drying pungent food or herbs together with other foods that might absorb their flavor. Stack or insert the trays carefully in the food dehydrator, making sure that each tray fits snugly into place. Make sure the dehydrator’s air vents are free from obstructions. Plug in or switch on the unit and, if this is an option, set the temperature and timer according to the recommendations contained in the manual for the food type/s being processed. While the food dehydration process is under way, this is an ideal time to prepare storage containers for the resulting dried foods. These can be plastic zip-lock type bags or jars with airtight seal lids. Check on the state of the food after a few hours, and, if necessary, replace the upper trays of a stackable dehydrator with the lower trays in order to ensure even drying of the contents. Note that not all foods dehydrate at the same rate, so it is best to monitor the process and remove foods as they become ready, placing them in covered containers to cool down. Replace empty trays in the dehydrator until all the food has been processed. After allowing the dried food to cool down, carefully pack it into clean, dry, airtight containers for storage and later use. Fill rigid containers as much as possible, and squeeze any excess air out of plastic bags. Once all the food has been removed, switch off or unplug the dehydrator, allow it to cool and then wash it for the next time you want to use it. Dehydrated food can be reconstituted for use in other food dishes by soaking it in water in the refrigerator for two to six hours, or in hot or boiling water for five to ten minutes (soaking at room temperature can cause harmful bacteria to develop), or it can be eaten straight from the container as a tasty, nutritious treat. Preparation of meat for jerky requires careful attention to hygiene, and only good quality lean meat should be used, as too much fat will make the jerky smell rancid. A sufficiently high internal temperature in the meat must be reached to kill pathogens such as Salmonella. The following directions are generalized, and you should consult your user manual for specifics for different types of meat and their processing. NOTE that the US Department of Agriculture recommends that meat for jerky is pre-cooked or cooked after dehydration to reduce the risk of foodborne illness. Trim the meat of as much fat as possible. Freeze the meat for one hour to make it easier to slice. Wash the cutting board and utensils thoroughly before and after use. Slice the meat into ¼” thick strips, across the grain for tender jerky or with the grain for chewy jerky. Marinate the strips, if desired, in a refrigerator before dehydrating. Boil the meat for 5 minutes in the marinade if pre-cooking the jerky. Remove excess marinade and position the strips on the dehydrator trays so they are close together but not touching or overlapping. Run the dehydrator for about 4 hours, or as recommended in the user manual, and then check on the meat every half hour to see when it is done. Jerky that is ready will crack when bent, but not break. When all the jerky is removed, switch the dehydrator off and let it cool down, then wash and clean all parts for later use. Heat the jerky for 10 minutes in an oven pre-heated to 275°F if you have chosen to cook the jerky after drying. When the jerky has cooled, dab it with paper towels to remove any surface fat, and store the jerky in air-tight containers until eaten. Jerky can be stored at room temperature for 1 to 2 months, but for longer storage, or to better retain its flavor, it should be stored in a refrigerator or freezer. 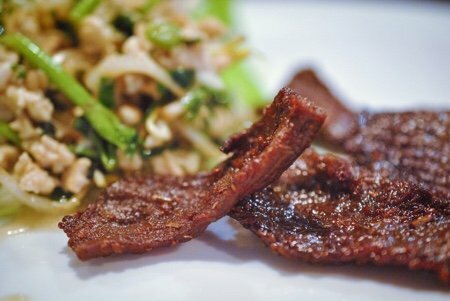 Jerky can also be made from ground meat, poultry or venison. Food dehydrators can also be used for making fruit leathers, yoghurt and for crafts such as drying flowers. Always follow the directions in your user manual. To reduce the amount of noise that the appliance may make during operation (the fan might cause a vibration or rattle), ensure that it is placed on a sturdy, level surface. If it vibrates or rattles, move it slightly this way and that for a better footing until the noise subsides. In a case where you can’t stop a vibration or rattle, contact the supplier for advice. Note that food that is too thinly sliced may stick to the tray or insert and be difficult to remove, whereas food that is sliced too thick may take a very long time to dehydrate and may retain moisture in its center. When spreading puree to make fruit leathers, always spread it slightly thinner near the center, as the outer parts will dehydrate faster than the center. Many food dehydrators do not include a drip tray (Aroma is an exception), so food particles and juices sometimes drop onto the base of the dehydrator and can be difficult to clean off. Placing a piece of food parchment or aluminum foil on the base to catch these drops will make it much easier to keep the inside of your model clean. If your dehydrator is a circular model with a base-mounted heater and fan element, cut out the center and trim the outer edge of the sheet to fit the base, ensuring that the warm airflow is not obstructed in any way, and that the airflow won’t lift the sheet at any time. Food parchment can also be used in place of mesh inserts when these are not provided with horizontal airflow (cabinet-type) food dehydrators, for drying smaller types of food that may fall through the grating of the drying trays. If it is made of a food grade material such as BPA-free plastic, a drip tray can be used for making fruit leathers where a fruit roll-up insert is not provided. Just remember to spread a thin layer of cooking spray on the tray, to ensure the product does not stick to the tray. Package dried food as soon as it cools to room temperature and before it has time to re-absorb moisture from the surrounding air. Fruit leathers, however, should be stored in plastic bags while still slightly warm. Label the containers that you put your dried food into with the type of food and date, making it easier to keep track of what you need to use. Do not use abrasive scourers when cleaning parts of your unit; this will cause scratches that food particles will dry in, making them difficult to keep clean. After a dried food container has been opened to start consuming the contents, store it in the refrigerator to stop the contents from spoiling. Are dehydrators made of plastic safe for drying food? Food dehydrators that are sold in the United States are required by the USFDA to have food contact surfaces that are made of food safe materials. The material used for food trays by most manufacturers is BPA-free polypropylene. BPA stands for Bisphenol A, a compound used in the manufacture of plastics to harden them, making them more durable. There is controversy about the use of BPA in food contact plastics but the FDA has not banned it. Nevertheless, many consumers like to steer away from the use BPA-containing plastics where possible. Can I get stainless steel trays for my food dehydrator? Some manufacturers of cabinet-type food dehydrators, such as Magic Mill, give buyers the option of purchasing dehydrators with trays made of either BPA-free plastic or food-grade stainless steel, the latter at an additional cost. Why do my fruit slices go brown when I dehydrate them? Some foods, such as the flesh of apples, oxidize when exposed to air for any length of time. This can be prevented by soaking the apple slices in citric acid or a Sulphur solution. The simplest option is to dip the slices in lemon juice before dehydrating them, although this might affect their flavor slightly. Why does my fruit leather come out brittle? Some juicy fresh fruits are too runny to produce soft, chewy fruit leathers. To combat this, puree a banana in with the other fruit to thicken it and it will come out just as you want it to. Can I use canned food in my dehydrator? Because canned foods are soaked in liquid, they are not suitable for dehydration because of the long period of time needed to remove all the moisture. It is always best to use fresh food in top condition when dehydrating. Remove any bruised or over-ripe parts of the food before dehydrating it. How will I know when my dried food is ready? Take a few pieces of food out of the dehydrator and seal them in a plastic bag. If water droplets form on the inside of the bag after a few minutes, the food is not yet ready and needs to be dried out more. If fogging only takes place, then it is ready. Is it safe for me to wash my plastic dehydrator trays in my dishwasher? Although some manufacturers claim that their plastic dehydrator trays are dishwasher-safe, it is recommended that they be washed by hand, as the plastic can become brittle over time when exposed to the high drying cycle temperatures. Alternatively, you can use the dishwasher but remove the trays before the drying cycle. Whether you buy a simple, small, inexpensive model, or a large model with all the extras, a top food dehydrator is always a good investment! Never let fresh food go to waste again, especially if you are able to grow your own fresh produce or buy in bulk at a discount price. Seasonal fruit and vegetables can be dehydrated and stored, to be eaten out of season or to be rehydrated and used in other dishes when not available in stores. You’ll save every time, and you and your family will be healthier for it as well. As a raw food adherent, you can find a good food dehydrator that operates at a temperature below 118°F, and make dried food without losing any of the natural goodness and nutrients you look for in your diet. So instead of letting your family snack on sugar and preservative filled store-bought snacks, get them onto tasty, nutritious home-dehydrated dried fruit treats. And if you are a jerky fan, it will be a lot cheaper to make your own, and you can also experiment with your own recipes for marinades to find the flavor that suits your taste buds. Many people even use food dehydrators to make treats for their pets, avoiding having to buy those expensive unappealing commercial products that may not even be very healthy for your furry companions. Making yoghurt, drying flowers, making potpourri, all these things and more are possible with a good food dehydrator, so it’s definitely time to get one of these incredibly versatile appliances. We trust that the information from our food dehydrators reviews will help you select the best food dehydrator for your needs.